Apparently Spike Milligan used to live in SE23 - 22 Gabriel Street to be exact. I think we need a blue plaque to commemerate his comic genius. He also lived in no 50 Riseldine Road, Honor Oak. Just this morning, at HOP station, there I was waiting for the 8.45 and I spotted an actor who regularly frequents our TV screens. Of course I can't remember his name or even the name of a film he has been in so now I am tortured trying to find out his name. I have spotted him a few times before at HOP station so whilst he may not definitely live in SE23, he regularly frequents our area. So, can we put our collective heads together and figure out who he is? He is quite plump, about 50, short brown hair and has distinctive squinted eyes. He's like a younger less jolly, posher Richard Griffiths. He has regularly featured in period dramas, especially around the 1940's in which he has had his hair oiled down to his head making him look vaguely repressed/sinister. My friend thinks his name may be Anthony Higgins, but I've no idea what Antony Higgins looks like and websearches have been fruitless. Can you help? Anthony Higgins is 6 feet 2 inches tall and has apeared in many films. There is an excellent young comedian living in the area who has won several national awards. I won't give his name away because he likes his anonymity. Connie Fisher who won the Sound of Music Maria role lives in Sydenham. I don't think it's Anthony Higgins - he was in the Draughtman's Contract and doesn't fit your description. Could you be thinking of someone who starred in the New Statesman with Rik Mayall? I think he got a mention on these threads sometime ago. I think the guy who played the (corrupt) bishop in Robin Hood;Prince of Thieves ( the one with Kevin Costner- on TV last night) lives in Forest Hill- I see someone just like him on the station platform most mornings. Anyone else noticed? From memory, I'm sure I've read somewhere that its either Timothy SPALL or the other short 'plump' fella from the old builders drama Auf' Pet who lives in the area. It definitely is Timothy Spall. Yes Sherwood I remember Rolf Harris living in Border Road in 60's. He had a signed photo in dry cleaners. An actor who is said to live in the area is Valentine Pelka. Rolf Harris lived at numbers 1 & 3 Border Road. He had two houses joined together. Back onto the subject of the HOP actor with a squint and without a name. Whilst Timothy Spall also lives in HOP, this is not the actor who I have spotted. He is a bit taller, posher and darker and tends to be typecast as sinister, uptight and villainous. It is also not Harold Innocent who was the corrupt bishop in Robin Hood with Kevin Costner. It also isn't Anthony Higgins as this man is about 5 foot 10 inches, not 6 foot 2. I think he was in a Peter Greenaway film but not the Draughtman's contract but of course I can't remember... The key characteristic which I think may prompt memories is this actor's severe squint... Anybody? Hmmm the Valentine person looks very much like a regular at Forest Hill pools. Pretty sure it was him. I've just checked Anthohy Higgins biog and he was in the Draughtsman's Contract. Blimey, seeformiles, you've been up all night thinking about this? Sounds like he could do with some posh glasses. Seemingly Harold Innocent died in 1993, two years after Robin Hood was made, so unless he's haunting the station, I've made a bit of a mistake. Was the guy in the New Statesman called Piers- another EuroMP who shared Alan Bstards office? Anyway, in the docu Chrissie Hynde of the Pretenders said that she lived in Forest Hill at the time, as did Don Letts himself. On the off chance, does anyone know where this flat might have been? In the documentary you actually see footage of inside the flat - It looks like a forest hill flat alright! I have recognised an actor who lives about two roads away from me. Eventually, I have been able to put aname to his face. It is John Arthur. I have seen him in several programmes. ME: Hi Linda, do you still live in Forest Hill? Hope that clears up matters. It was, as you see, a deep, thought provoking moment. No- weren't my feet. I went out with someone who knew them though. And I used to live on Devonshire Road. I would put them on my CV/showreel if they were, though, but very carefully, and not without a hint of irony. According to Lewisham Guide, Boris Karloff better known as Frankenstein lived in Forest Hill before moving to Hollywood. The thriller writer (no not the Michael Jackson song) Raymond Chandler lived in Devonshire Road. I seem to remember about 5 years ago there was a shortlived wine bar called "Karloffs" a few doors away. Linda Barker lives in Underhill Road. Not quite FH but not too far away. Reliable sources tell me that she still uses the video shop in Dartmouth Road. This is embarrasing, but who is Linda Barker? what is she famous for? I've often seen Stephen Lewis (Smiler-Last of the Summer Wine : Blakey - On the Buses) in Sainsburys. To add to Peter Perrett and Don Letts... the more contemporary figure of Luke Pritchard, former boyfriend of Katie Melua and singer in popular beat combo The Kooks, turns out to be from Forest Hill too. Although he moved to Clapham when he was 3 - which was clearly the start of his sliding credibility. Saw Shaun Wright Philipps of Chelsea reserves and England sitting in a flash new Mercedes coupe outside a house on Stillness Road last night. Also regularly see Hugh Fearnly-Whittganstall driving down our road as well. I think Wright Philipps is from around here, didn't he go to Haberdashers Aske's school in Brockley? I think his gran lives around Stillness Road; she attends the church on the junction of Wickham Road and Brockley Rise- I was involved in a housing project near there and found this out. I always thought it an interesting coincidence that he was so good at football and wonder how far this was a result of 'nurture' by his adoptive father rtaher than ' nature'. Otherwise a coincidence? The Only Ones have reformed (with original line up). "This is an improbable reunion" - a heritage rock magazine. There was an interview with Peter Perrett in yesterdays Guardian and he talks about the days he was "sequestered in a crumbling gothic house in Forest Hill that he fortified against police raids". He dealt heroin then and now talks about declining standards of morality among drug addicts "In my day, being a drug dealer was a respectable f...in' profession". Oh, for the good old days of honest drug abuse. Great to hear they've reformed though and don't worry, P.P. now lives in Norwood. ATP is an artist-curated music festival held a few times a year at a holiday camp - for years it was Pontins at Camber Sands, now it's Butlins all the way over at Minehead. They often get "classic" bands to reform to play - has included Television and Love in the past. But there's always loads of obscure stuff and very new performers, too. Saw The Only Ones on Friday night - Pete Perrett's certainly showing the signs of a life lived on the rock 'n' roll edge. He came on stage to a unified gasp of "My goodness, he's looking barely alive! ", or perhaps something more, er, colloquial than that. You get the drift. I saw him wandering around a bit over the weekend - he looks even frailer close up. There's a lesson to be learned there, boys and girls. Maybe. So we can now add Andy Coulson, David Cameron's spin doctor, to the list of famous residents. If we are allowed fictional people, Siobhan Clarke's parents, Eve and Teddy live in Forest Hill. Reference can be found on pages 27 and 276 of 'The Naming of the Dead' by Ian Rankin, the latest Rebus novel. Something for all the Forest Hill book groups to read. The question is why did Ian Rankin choose to be so specific, is there a real life Forest Hill connection? Perhaps if any of the Forest Hill book groups are surprised by a TV crew and the author they can ask him. Bob from Brockley (http://brockley.blogspot.com/2007/07/lew...drink.html) draws our attention to Jim Connell, an ex-resident of Honor Oak http://en.wikipedia.org/wiki/Jim_Connell who made good use of the train journey home to write the Socialist Anthem. I am so excited. Helen Worth, born Cathryn Helen Wigglesworth, better known during my brief time watching Corrie as Gail Tilsley, was, wait for it, a regular at the Moore Park Tavern. Why she lived in London and commuted to Manchester I haven?t a clue, although she still has a flat in the metropolis. Did she live in SE23, does she still live in SE23? Any answers out there? Green squawking birds are also another famous resident, but not seen too many of the red neck variety recently. (thanks to Phil the builder for the Gail connection - we are talking 20 years or more ago. She seems to have a flat in London. But I cannot find out where. If you saw her in the MPT, possibly she lives in Dulwich. Not quite a famous person living in SE23 but a famous person who died in (or at least, very near) was original AC/DC lead singer Bon Scott who was found dead from alcohol poisoning in a van outside his friend's flat in Overhill Road. You can still see some graffiti in his memory outside the property. I can give another sighting of Linda Barker and her SUV in Underhill Road. I also heard the butcher in Wood Vale boasting about how she'd bought a roast from him that she was going to serve to some z-list celebs that she was entertaining. I see that Linda Barker will be switching on the Christmas lights at the Honor Oak pub this year. For those among us who can remember when actors earned their keep (I'm talking 1950's & 60's here...) I can confirm that both Welshmen Meredith Edwards (Film - The Cruel Sea) and Richard Davies (TV comedy - Please Sir!) lived in Canonbie Road. Just around the corner at the bottom of Ringmore Rise lived actor Ronald Hines, who used to pop up in things like the Avengers, Doomwatch and Elizabeth R. And if you've just mouthed "Who?" then you're simply too young! The bloke who did our blinds reckons Brenda Blethyn lives on Ringnmore Rise. New one, for those of us with kids. Sarah-Jane from cbeebies (Tikkabilla, Higgledy Piggledy House etc) was waiting on platform 1 this morning. She was reading a kids magazine/comic - research I hope. She used to be a contortionist. So I suppose she will be at home travelling on our trains! Picture of Sarah-Jane Honeywell for Sherwood and those waiting for trains. I think I will take up train spotting as a hobby. But only at Forest Hill railway station! This post was last modified: 25-10-2007 12:52 PM by Sherwood. Thank you for posting that photograph. If you are saying that the ladies of Forest Hill are not top totty, I hope you have a secure bunker to take refuge in! Thats not Sarah Jane, thats Gail Platt from Corrie. Michael, you tease, clearly you know that Gail did frequent the Moore Park Tavern, six degrees of separation? And for those of you watching Master Mind last night and the guy with Joe Orton as his specialist round - not one question about Wood Vale - what is going on Humphries? May I ask exatly where is the Moore Park Tavern? Do you mean the Moore Park Hotel as was? On the celeb issue, Jenny Eclaire lives in East Dulwic and Brenda Blthyn does not live in Ringmore Rise, I suspect she's another Dulwich resident. 1) tell me how to put pictures on this website a la Michael as I tried to put some of Gail on here and failed miserably. 2) start up a separate thread on six degrees of separation ( the theory not just the film) as its a fascinating subject and one which my family were discussing all weekend. Why not start both yourself? According to Chrissie Hynde (The Pretenders) both she and Joe Strummer (The Clash) lived in a flat in Forest Hill "with the guys who became the Basement Five". Is it possible that London Calling (the obvious choice for our national anthem when London declares its independence) was written in a flat in Forest Hill, just like the Socialist anthem The Red Flag? I have been reading 'Culture Clash: Dread Meets Punk Rockers' (SAF: London, 2007), the autobiography of Don Letts, DJ, film-maker, member of Big Audio Dynamite and general mischief maker. Don grew up in Brixton, going to Christchurch Primary School and Archbishop Tennison secondary, but during the punk period when he was DJing at the Roxy club (early 1977) he 'moved to a grand old house in Forest Hil, built on the second highest point in London' with his then girlfriend Jeanette Lee - later a member of Public Image Ltd and later still co-owner of Rough Trade records. Leo Williams and JR, who were in black post-punk band The Basement 5, lived there and 'Both Joe Strummer and Chrissie Hynde also lived there at different times'. Letts also mentions 'hanging out with John Lydon after the Pistols' gig at the Nashville. We went back to my house in Forest Hill and spent the whole night talking about reggae music and Jamaican culture'. 'After the shows at the Roxy, Chrissie Hynde, some of the Slits, the Clash, Generation X and the Pistols would hang out in Forest Hill, often all at the same time', while Letts spliced together the super 8 film that would become 'The Punk Rock Movie'. All in all, the house in Forest Hill sounds like a punk powerhouse. Not sure of the address or whether the present occupiers would necessarily want to know if they've read the book which also describes a sad teenage suicide in the house. Part of the Transpontine mission is to document the various byways of music in South London. In this spirit, and courtesy of Graham Burnett's 'Anarcho-punk archives', we bring you this treasure from Forest Hill, circa 1985. 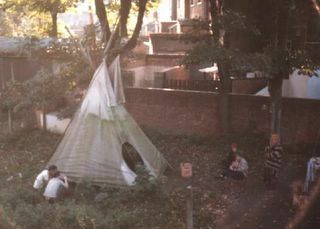 The teepee belonged to Steve Ignorant of anarcho-punk legends Crass, and was in the garden of the house where members of fellow punk pacifists Flux of Pink Indians lived. Flux put out their first (and in my view best) LP, 'Strive to Survive Causing Least Suffering Possible' in 1982. I even had the All the Arms we Need' poster from this on my bedsit wall. Derek Birkett of the band later formed One Little Indian records, putting out lots of cool stuff by Bjork, Alabama 3, Kitchens of Distinction and many others. In fact, Bjork was interviewed at the Forest Hill One Little Indian HQ for Sounds in 1987 (read it here), when she was still in the Sugarcubes. On the subject of record companies in Forest HIll, Fashion REcords (a UK reggae label) used to run out of an industrial unit, opposite the back of Shannons Garden Centre, whilst Hopsital records (a leading jazzy drum and bass label) still have their offices up the top of Dartmouth Road (technicaly SE26, but close enough).